Successfully Added Mini Motion Detecting Video Recorder to your Shopping Cart. 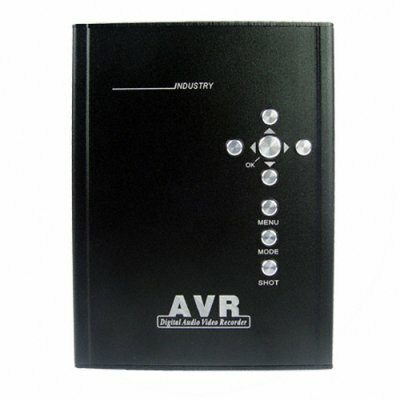 Pocket DVR with motion detection capability for auto video and audio capture of moving objects or people for a very secure way to keep yourself and your possessions safe. This security device comes with excellent features such as AV IN for connecting your choice of security camera as well as a DC 12V power out for easy powering of the camera, Video OUT for connecting to an exterior LCD screen, a SD card port for directly saving captured images, an included 256MB SD card to get you started, and best of all, absolutely no software installation needed. Source this wholesale priced surveillance digital video and audio recorder just like the pros, direct from China. The camera included in the photos below is for demonstration purposes, it is not included with this DVR..
A great device. I use it all the time for birdwatching and everybody is astounded with the results I get.